CHE + 282. Granger, Wyo. — 16 miles north of the course on the Union Pacific where the Oregon Short Line joins the Union Pacific from the north. Pilot's Directions, February 21, 1921, No. 282. Granger.-16 miles north of the course on the Union Pacific where the Oregon Short Line joins the Union Pacific from the north. 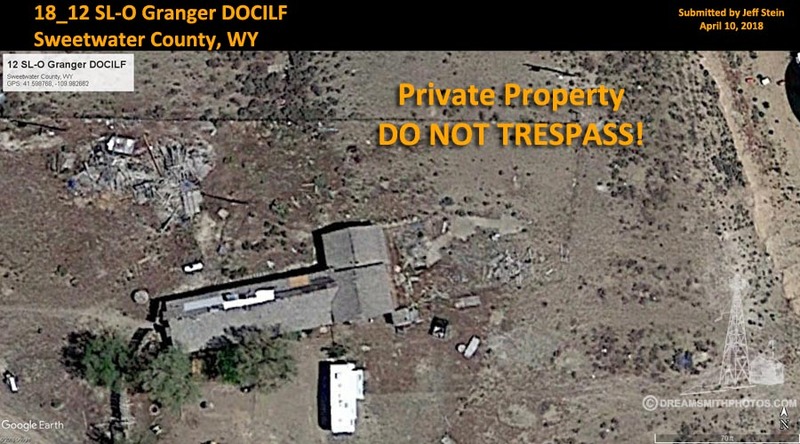 Location of 12 SL-O Granger DOCILF Plotted to Google Earth. White star is the location of the arrow in 2018. 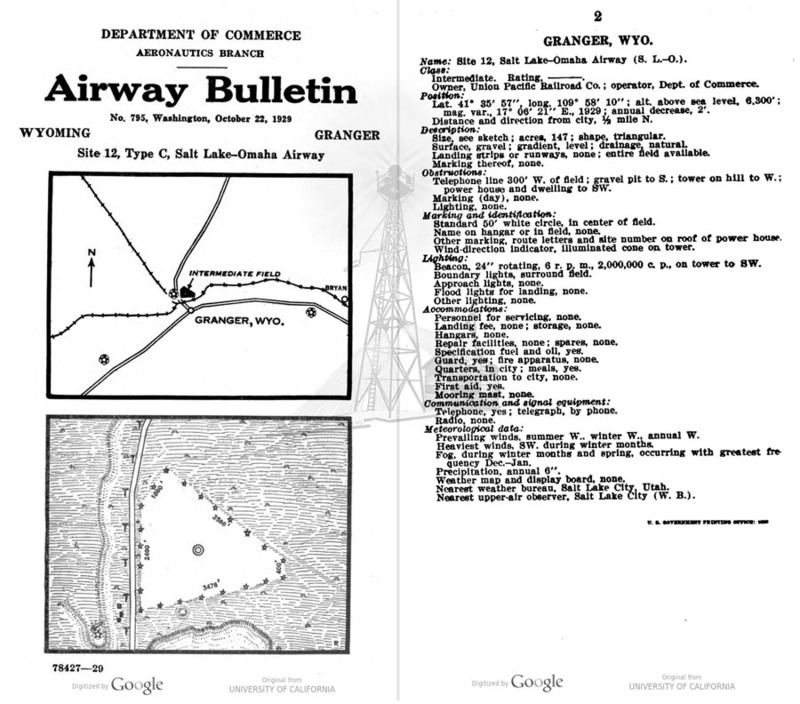 Yellow thumbtack is the Latitude and Longitude given in Airway Bulletin No. 795 in 1929. Department of Commerce intermediate field, site 12, Salt Lake-Omaha Airway. One-half mile N. at intersection of highway and railroad, Altitude, 6,300 feet. Triangular, 147 acres. 3,500 feet NW./SE., 2,400 feet N./S., 3,478 feet E./W., gravel, level, natural drainage; entire field available. Directional arrow marked 12 SL-O. Pole line 300 feet W. gravel pit to S., tower on hill to SW. Beacon and boundary lights. Beacon, 24-Inch rotating, with green course lights flashing characteristic "2" (. . —). Aviation fuel, day and night. Teletype. Department of Commerce intermediate field, site 12, Salt Lake-Omaha Airway. One-half mile N. at intersection of highway and railroad. Altitude, 6,300 feet. Triangular, 147 acres, 3,535 feet NW./SE., 3,045 feet N./S., and 3,400 feet E./W., gravel, level, natural drainage; entire field available. Directional arrow marked "12 SL-O." Pole line 300 feet W., gravel pit to S., beacon tower on hill to SW. Beacon, boundary, and approach lights. Beacon, 24-inch rotating, with green course lights flashing characteristic "2" (. . ), on knoll immediately W. Aviation fuel, day and night. Teletypewriter. Department of Commerce marker beacon, characteristic signal "S" (. . .), operating frequencies 290, 260, and 278 kc.